The Boeing 200 Monomail was a low-wing cantilever monoplane that provided room for a relatively short lightweight retractable landing gear, a streamlined fuselage, with an engine covered by an antidrag NACA cowling that added up to an advanced, extremely aerodynamic design. The low wing seems quite logical now but some of the early designers had a false notion that high wings were more stable laterally. This belief was based on an erroneous idea of "pendulum stability." The Monomail was so aerodynamically clean that the engine would over-rev in level flight at full throttle, because the propeller was adjusted on the ground to a low pitch to provide high enough rpm for takeoff. Achieving the highest possible cruising speed would have required a controllable propeller, which was not yet available. By the time the variable-pitch propeller and more powerful engines were available, the Monomail was being replaced by newer, multiengine planes such as the Douglas DC-3. 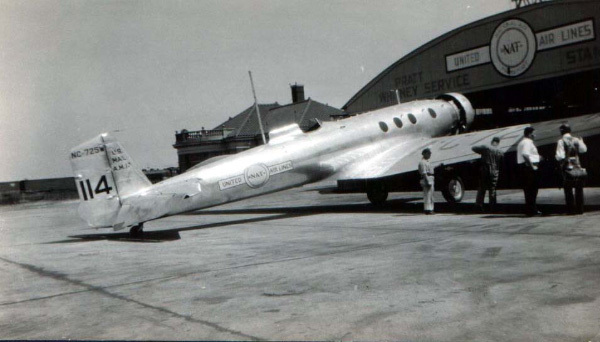 Only two Monomails were built, since the single-engine mail-plus-passenger plane was giving way to multiengine designs, and in 1934 the Department of Commerce made multiengine configurations a requirement for passenger transports. The Monomail paved the way for Boeing's development of large, multiengine aircraft, such as the Boeing Model 247, as did the first Boeing monoplane bomber, the B-9 bomber, shaped like a cigar and nicknamed the "Flying Panatela." One Pratt & Whitney Hornet B, 575 hp (428.8 kW). Created November 12, 2009. Updated October 12, 2013.